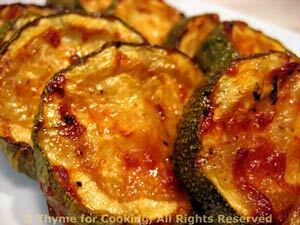 Thyme for Cooking Summer Recipes: Barbecued Zucchini Slices. Mon mari says "they are done when they start to sag in the middle and they have brown grill marks on them". You can put them in a basket, but we do them directly on the grill. In small bowl mix all ingredients except zucchini. Slice zucchini into 1/2 inch thick rounds. Do not peel first. Put rounds onto a plate and spoon a bit of sauce onto each side. Place directly onto grill of barbecue. Grill just until soft and starting to brown, 10 - 15 minutes, turning once.